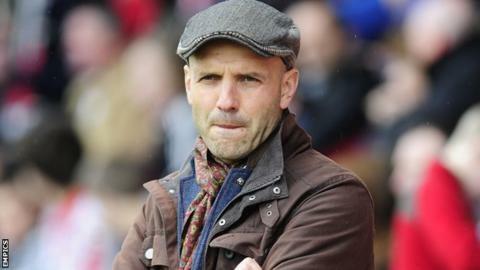 Exeter City chief executive Julian Tagg says there has been no approach from Swindon Town for manager Paul Tisdale. "There has been no approach from anyone for Paul Tisdale," Tagg told BBC South West Sport. "Every time a vacancy comes up we expect Paul to be linked with it as he's a very good manager." Tisdale is one of the longest-serving managers in English football, having taken the reigns at Exeter in May 2006. He guided the Grecians to promotion back into the Football League in 2008 and won promotion to League One the following season. "It's up to Paul as to how he deals with those things, but he's not been tempted by anybody yet," Tagg said. "And I think it would be strange for him to leave us and go to a club which is £13m in debt."